When it comes to baby food, we have a lot of choices out there. It can sometimes feel overwhelming walking down the grocery store aisle, trying to select the right food for your little one. We of course want to make sure it has all the right ingredients, all while actually tasting good, so your baby winds up with more food in their mouth than on their shirt. Now that I’m on baby number two, you can imagine we’ve tried all different brands. It wasn’t until having Jake that I came across Yumi baby food. 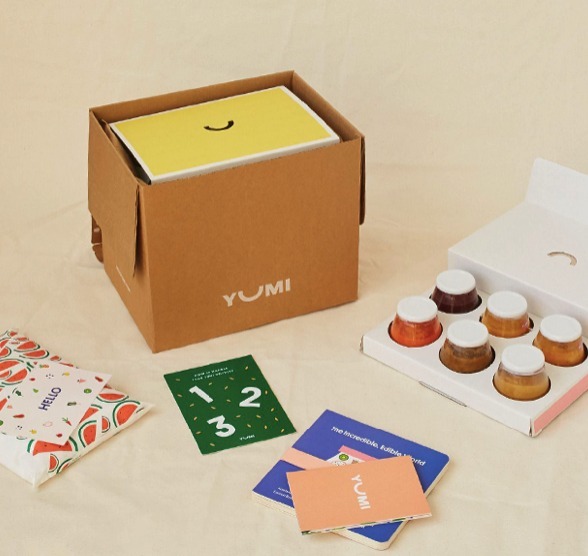 Yumi is the definitive source for parents like me, looking to understand what exactly they are feeding their children and how it affects their little growing bodies. Yumi meals are fresh, organic, packed with nutrition, and best of all, delivered straight to your doorstep. This California-based company takes a holistic approach to baby’s health and wellness, all while staying transparent with trustworthy information. As a parent, you want to know exactly what you’re feeding your baby. You want to know that they are ingesting quality ingredients that will nourish their little bodies as they continue to grow. With Yumi, their food does exactly that, and Jake loves them! With recipes like Paw Paw, Chiwa, and Garden Party, your baby’s taste buds will surely be impressed. Yumi even has an in-house team of experts that includes holistic nutritionists, plant based chefs, doulas, doctors and more to ensure maximum nutrition and flavor in every spoonful. If you live in California and are interested in trying a new baby food, I encourage you to check out Yumi. They’ve also expanded into select cities in Nevada and Arizona, more to come as well! With my hectic schedule, nothing beats having a weekly delivery of Jake’s food that I literally don’t have to worry about. I know it will be there at my front door each week, and if we don’t go through all of it, they can be frozen for up to two months! For more information on Yumi, visit their website here!